TDIClub is a website dedicated to the VW TDI (Turbo Direct Injection Diesel) engine. Most of the action is in the discussion area (also called forums). If you are looking for info on the current VW emissions scandal, please go to our FAQ thread that has a timeline of events, links to the report as well as some links to what VW has to say. As info is added we will update that thread. Many members who have met originally online, often meet in person at regional Get-To-Gethers (or GTGs for short). There is also an internatation yearly GTG called TDIFest that typically happens on the Labour Day weekend. TDIFest 2016 is coming to Sturgeon Bay, WI September 2-4th. You can read about it in the TDIFest 2016 discussion forums. In previous years it has been held in Sunday River Ski Resort in Bethel, Maine(TDIFest 2015), Sunday River Ski Resort in Bethel, Maine(TDIFest 2013) Ypsilanti (Ypsi), MI (TDIFest 2012) Lexington, KY (TDIFest 2011) Portland, OR (TDIFest 2010), Washington, DC (TDIFest 2009), Cincinnati, OH (TDIFest 2008), Montréal, Quebec, Canada (TDIFest 2007), Philadelphia, Pennsylvania (TDIFest 2006), Lake Mills, Wisconsin (TDIFest 2005), New England (TDIFest 2004), outside Toronto (TDIFest 2003), Grand Rapids, Michigan (TDIFest 2002), Park City, Utah (TDIFest 2001) and the first one was in Wilmington, NC (TDIFest 2000). To join TDIClub is a very informal process. Just go to the Forums and register for an account. Once your account has been activated you will be a member and can join in the discussions or just 'lurk'. It is recommended that you sign-up for an account as it brings a lot of extra features to you even if you are not involved in daily discussions. You can also meet members at various GTGs that may be held near you. While diesel cars are available in many countries around the world, Volkswagen has been the only manufacturer selling diesel cars in Canada or the US (other than the Mercedes E320 CDI starting at $52,000US). Sometimes the TDI is considered a "niche" product and I've venture to guess that is one reason there is such a unique crowd of members. Where else can you say economy and performance in the same sentence? With this economy, one can also get great range. While not typical, here is an example of someone getting 1400 miles (2254km) on one tank of diesel. There are three main generations of TDI's found in North America. The first generation was available till 2004 used a distributor-type fuel pump and are designated VE engines and were 1.9l in size. After that VW introduced the Pumpe-Düse (unit injector) engines (PD for short) that were sold in Canada and the US from 2004 till 2006. The third and latest generation of TDI engines which finally arrived in 2008 are common rail and call a 'Clean Diesel'. As you can see there was a bit of a hiatus on the avialability of TDI's during 2007 which was due to changes in US and Canadian emission regulations. The VE engines were found in A3 Jettas, B4 Passats (1995/1996), New Beetles (till the end of 2003), Jetta IV (till the end of 2003), and Golfs (till the end of 2003). The VE engine found in the A3 Jettas and B4 Passats were rated at 90hp and 149ft.lbs of torque. The A4 Jetta, New Beetle, and A4 Golf were rated at 90hp and 155ft.lbs. The PD version were available in New Beetles (2004 - 2006), Jettas (2004 -2006), Jetta Wagons (2004 - 2006), Golfs (2004 -2005), B5 Passat (2004 and 2005), and the 2005 V10 Toureg. The PD found in the New Beetles, Jettas, and Golfs are rated at 100hp and 177ft.lbs torque from a 1.9l engine. The B5 Passat with it's 2.0l TDI pumped out 134 hp and 247 ft.lbs of torque. The king of power is the 5.0l 310HP V10 Touareg that puts out 553 ft.lbs of torque. As for the Clean Diesel Common Rail engines they became available in late 2008 for the Jetta wagon and sedan. The engine displacement is slightly larger at 2.0l vs the previous 1.9l, but power jumps to 140hp @ 4000rpm and torque is 236 lbs-ft between 1750 and 2000 rpm. Shortly after the 3.0l V6 version rated at 221hp@ 4000rm and 407 lbs-ft between 1,750 and 2,750 rpms became available for the Toureg 2. VW has also announce that the 2.0l TDI will be available for the next version of the Golf in early 2010. Demand for TDIs is extremely high. An example is in 2005 Canadian sales of TDIs accounted for over 50% of models where a TDI was an option. Another example is in 2006 the Jetta wagon was ONLY available as a TDI, they didn't even bother with other engine types. In Europe the selection is much more advanced from the 1.2l Lupo that gets 2.9l/100km (81USmpg [97 Imp mpg]) up to the 313hp V10 TDI with 553 lbs of torque and everything in between. Most recent revision September 28, 2015. 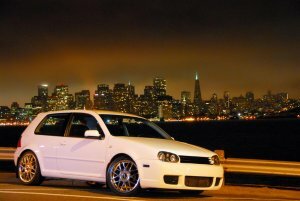 Fred's TDI Page (TDIClub.com) is not affiliated with the VWoA or VWAG.